For a guy who published around 400 works of short fiction during his career, John D MacDonald repeated himself fairly infrequently. I've caught a couple of instances where a short story was obviously modeled on one he had written previously, mainly occurring in the magazine This Week. Yet over a career that spanned 40 years, I can only find two short stories that bear the same title. This is amazing, considering that over half of MacDonald's titles were changed by magazine editors prior to publication. The repeated title is, of course, "Hit and Run." The first story bearing this name was originally published in the August 1952 issue of Good Housekeeping, while the second was published nearly ten years later in the September 16, 1961 issue of the Saturday Evening Post. This posting will discuss the original story. MacDonald's entry is a fairly straightforward criminal investigation story, showing off the author's detailed knowledge of police procedure. The title page announces it as "a story of suspense," yet there is no suspense here: a cop methodically tracks down a hit and run killer. What does make the story interesting is what MacDonald does with character, and how the crime he is investigating changes the policeman in charge of the investigation. I'm sure it's what "sold" the story to a magazine like Good Housekeeping and I doubt it would have been published here if it was simply another JDM "howdunit." State trooper Del Carney is sitting in a small police substation somewhere west of Syracuse. A freak May snowstorm has made the late-night roads treacherous and he is finishing up an accident file involving a car full of teenagers. In comes his subordinate, Trooper Tillotson accompanying an attractive, well-dressed woman in her middle thirties. Tillotson found her nearly freezing to death in a parked car along Route 83, alone and with the engine off. The car had run out of gas and her husband left her there to walk down the road to the nearest station. It had been some time and he hadn't returned. Carney has her sit by the warm stove and sends Tillotson back out to slowly trace the route from the car to the closest gas station. "Turn your spot on the ditch," he tells him. "Look for anything that might be a man covered up with snow." Realizing that he has alarmed the women, he apologizes. "We've got to think of a hit-and-run driver, or a heart attack." "When he glanced over, he saw that she had taken off her fur jacket and hung it on the back of the chair... It was a nice tweed suit, he decided. And she had that square-shouldered, trim-hipped, long-waisted look that made clothes look good... She was looking at him with polite attention, and he felt a sudden unreasoning jealousy at this Fairliss, who at -- what was it? -- forty-seven had found this woman and married her. It had been a long time since he had felt jealousy toward any man." "Usually it happens over the phone; that was easier because you couldn't see their faces. The expression on this woman's face startled him. He was not easily moved by looks of anger; he had seen the lusterless animal eyes of the psychotic killer-type. This was cold, intellectual ferocity, glistening. 'Hit and run, Sergeant? I want him caught. I want to look at him.'" Then Carney does something he has never done before, and he realizes his stupidity as soon as it's done: he promises her he will find the driver. The next day Carney begins his investigation and Linda Fairliss returns home. Based on the evidence at the scene, it appears that a car came around a curve, slid and hit Peter Fairliss with the rear side of the car. The police are able to get some paint scrapings that later point to the vehicle being a 1936 Ford. Carney proceeds dutifully, checking county registration records for the current year, then state records, and when that brings nothing he goes back a year, then another. At one point his superior officer tells him to drop the case, but Carney asks if it would be okay to nose around on his days off. "What's your stake in this?" asks his boss. "This one got me a little." "He felt a mild irritation that he had condemned himself to pounding around the countryside. Quixotic, he thought, that's me. You figure you're old enough and practiced enough and bored enough to be at last forever beyond the reach of any puerile self-identification with the maimed and lost, the casualties of four-lane civilization. And then one sneaks up on you. Linda Fairliss, widow. Thirty-six. Not young, not old." "An idea nibbled at the edge of his mind. He turned on the light and sat on the edge of the bed -- a precaution against falling asleep before the idea was fully developed. It was a trick he hadn't used for a long time. Not since he had been a young instructor at the State university. Before Chris and the stillborn child had shared a common grave. Before he had so arbitrarily selected a calling as remote as possible from the world that reminded him of Chris... When you want to hide something, you either hide it where it will not be seen at all or you hide it where it will be seen but not noticed..."
"Hit and Run" is a satisfying, well-written story that leads to unexpected places, a story that in the hands of a good writer resonates and stays with you long after you've finished reading it. 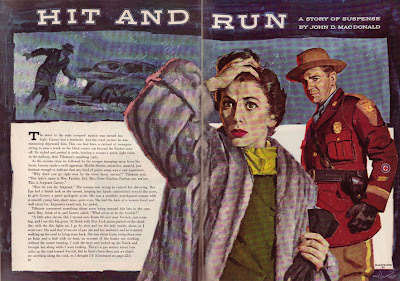 And while the author's 1961 story titled "Hit and Run" has been anthologized over a half dozen times, this story has never been republished. It's a shame. 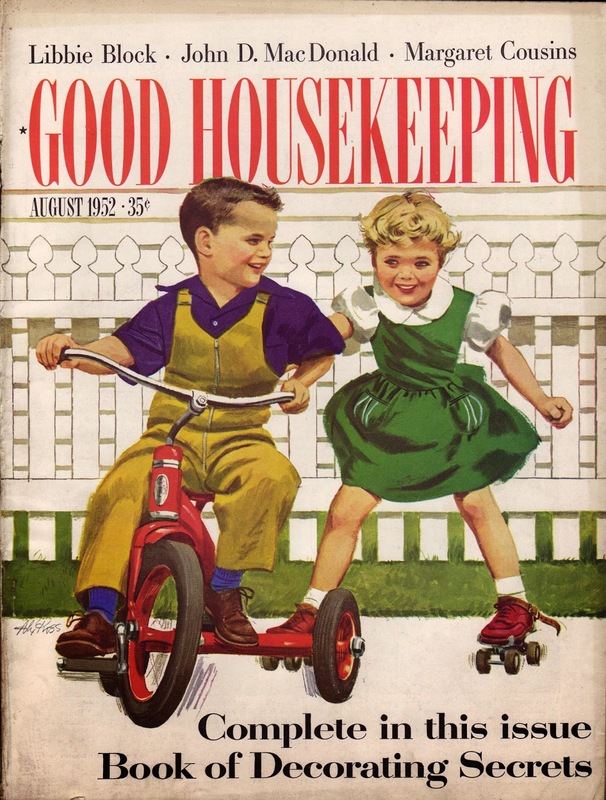 And, in case you're wondering, the cover of this particular issue of Good Housekeeping is not an illustration from the story!